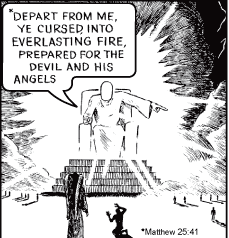 Jack Chick, whose insular and idiosyncratic brand of personal Christian belief hit a resounding chord with a cross section of the American public likewise enthralled with his sanctimonious Christian orientation while putting him at odds with a number of Christian denominations and casting him as the laughingstock of a significant portion of those among the younger generations who rejected his revival of the fire-and-brimstone scare tactics that emanated from the pulpit for centuries, has died. Chick, who died at his San Dimas home on October 23, had a perhaps legitimate but nonetheless dubitable claim to being the world’s most published author. His publications consisted of what were essentially religious tracts in a miniaturized comic book format, slightly less than three inches high by five inches wide in dimension, and approximately twenty pages in length. Chick was born in the Boyle Heights district of Los Angeles on April 13, 1924 and later moved with his family to Alhambra. According to Chick, he was not religious in high school, but was active in his high school drama club. Indeed, his future work would take on a melodramatic tone. In February of 1943, Chick was drafted as a private into the U.S. Army. He served for three years in the Pacific Theater of World War II, serving in New Guinea, Australia, the Philippines, and Japan. After he was discharged, he abided by his interest in drama, and pursued the dramatic arts on an academic basis at the Pasadena Playhouse School of Theater on a two-year scholarship. At the Pasadena Playhouse, Chick met his wife while working on a production there. This was instrumental in his future commitment to Christian evangelism. Lola Lynn Priddle, who was born in 1926 and would die in 1998, was from Canada, the product of a very religious family. Priddle and her parents introduced Chick to the Charles E. Fuller radio show, the Old-Fashioned Revival Hour. It was while he was listening to an episode of this show that he converted to Christianity. Chick and Priddle married in 1948 and had one child, Carol, who died in 2001. Predating his religious tract work, Chick found employment as a cartoonist. From 1953 to 1955, Chick drew a single-panel cartoon titled “Times Have Changed?,” the text for which was written by P. S. Clayton, Times Have Changed?, syndicated by the Mirror Enterprises Co. in Los Angeles area newspapers, resembled, and may have been a forerunner to both the B.C. comic strip and The Flintstones animated cartoon. After converting to Christianity, Chick was looking for a way to fulfill his newfound messianic zeal when he learned from missionary Bob Hammond, who had broadcast in Asia on the Voice of America, that the Communist Party of China had propagandized to its country’s citizenry via small comic books. Chick was simultaneously working as part of a prison ministry and he created a flip chart of illustrations to use with his presentation. He formulated from this series of ideas comic-style witnessing tracts. While working for the tape recording equipment and avionics manufacturing concern, AstroScience Corporation in El Monte, he self-published his first tract, Why No Revival?, with a loan from his credit union in 1960. He published his second tract, A Demon’s Nightmare, in 1962. He created and published a number of other tracts over the next several years, seeking to distribute them from Christian bookstores, with mixed success, and to recoup the cost of printing by selling them to missionaries and churches, with slightly more success. In 1970, he established Chick Publications on Archibald Avenue in Rancho Cucamonga. The upshot of Chick’s message: Abandon your earthly vanities, repent of your sinful nature and wicked ways and do it now, before you die and are whisked away into everlasting and interminably excruciating damnation, far from the sight of the Lord you are presently displeasing. His quintessential tract was the 1964 endeavor “This Was Your Life,” which was loosely based on the contemporaneous television show of that era. Chick would spend the rest of his life attempting to recreate the impact – some would say highly positive others would say appalling – of that stab at proselytizing. In Jim Chick’s view, the wages of sin were certain. The damned soul is then seen being cast into the lake of fire by the escorting angel. While Chick did not use a strict template, per se, for most of his work, there was an undeniable commonality to his themes and storylines. A common thread running through Chick’s cosmology was that of universal spiritual warfare. Most of his books revolve around the concept of good vs. evil, as illustrated by at least a single Christian character (sometimes human, sometimes in the form of an angel or perhaps God, himself) and one or more “non-Christians,” i.e., unrepentant sinners. In nearly all storylines the “non-Christian” was a classically bad, evil or wicked character or a dupe, that is, a member of a “false religion.” In a lesser number of tracts, the “non-Christian” would be depicted as a good or moral character who might even engage in admirable, virtuous or good works but who was fated, nevertheless, to eternal damnation for not having accepted Jesus Christ as his savior. In these stories, the Christian would invariably seek to convert the non-Christian and, in most cases, fail. Ultimately, after the non-Christian would decline to repent, Chick would depict him falling victim to a merciless and everlasting punishment. This punishment would befall even those who were virtuous if they had not accepted Jesus Christ as their personal savior, reinforcing Chick’s belief that one could not depend merely on personal morality or good works to gain eventual entrance to Heaven, but could only achieve salvation through Jesus Christ and the remission from sin He offers. Chick categorized some of what at this point are considered as relatively mainstream religions – Mormonism, Jehovah Witnesses and even Catholicism, the first incarnation of Christianity – as false religions. He was unkind to Jews, implying they “murdered our savior.” The Catholic Church, in particular, was demonized by Chick, and was the subject of at least 20 of his tracts, none of which was complementary toward the world’s largest Christian sect. In one of those tracts, titled Are Roman Catholics Christians?, Chick draws the conclusion that Catholics are not true Christians as he defines them. The Catholics are, he promulgated, engaged in a grand conspiracy to deliver mankind into the hands of Satan, and along the way that false church actively created other Satanic entities such as Islam, Communism, Nazism, and Freemasonry. It is unknown how many souls were saved by Chick’s approach and how many people who were on the road to perdition he managed to pluck from the grasp of the devil. He appears to have been earnest in his intent to spread the word of the Lord rather than making money. At the time of his death, his comic books could be purchased in lots of 25 for 17 cents apiece. Though most of his older tracts were out-of-print, Chick Publications would upon request of 10,000 copies or more perform a special printing run of most of the out-of-print tracts. Canada has banned the distribution of his books outright. The magazine Christianity Today denounced Chick as a “nonlearned evangelical” engaged in “atavistic anti-Catholicism.” The Catholic Church has engaged in extensive polemics to refute his claims. Initially, Chick wrote and illustrated all of the comics himself, but in 1972 he hired another artist, Fred Carter, to illustrate many of the tracts. In failing health for the last several years, Chick chose David Daniels, the company’s author and researcher since 2000, as his successor. Chick and his comics – with their simplistic emphasis on right and wrong, smug assumption of moral superiority, illustration of the certainty of damnation and reliance on fear as a psychological cudgel to effectuate conversion – have become a comic foil and an object of derision for many in popular culture and the atheists Chick targeted.